Be Intrigued. Be Seduced. Be Warned. That part doesn’t work out so well. 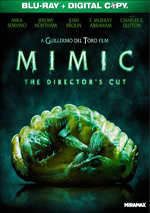 A group led by Xavier Fitch (Ben Kingsley) creates a female hybrid who turns out to be dangerously violent. “Sil” (Natasha Henstridge) escapes captivity, so a team attempts to track down and stop her before she causes mayhem. Watching Species now, I find myself unsure why I recall that it seemed like an Alien rip-off 20 years ago. Perhaps this came from the involvement of HR Giger, the creator of the iconic “Alien” design. Giger worked on the alien creature, and I suspect ads touted his involvement. Although my synopsis offers a chronological pattern of events, the movie doesn’t play the material that way. Instead, it opens with Sil as an adolescent (future Oscar nominee Michelle Williams) and lets us see attempts to slay her before we know anything about her. Species appears in an aspect ratio of approximately 2.35:1 on this Blu-ray Disc. One of the very first Blu-rays to reach the market in 2006, the transfer showed its age. Though I’ve seen worse, so the image wasn’t a total loss. Still, it left a lot to be desired, especially in terms of print flaws. The movie exhibited quite a few small specks and marks, so it clearly could’ve used a good cleaning. For the most part, sharpness worked fine, as much of the movie showed reasonable clarity and accuracy. However, edge haloes created distractions and made the flick less precise than I’d like at times. No issues with jagged edges or shimmering occurred. The movie showed artifacts, though, and looked more “digital” than I’d like. Colors seemed decent. Species went with a blue-oriented palette much of the time, so it didn’t feature a lot of tones. Nonetheless, the elements we got looked solid. Blacks were dark and tight, while shadows delivered smooth material. This wasn’t a terrible presentation, but it seemed below average. On the other hand, the film’s uncompressed PCM 5.1 soundtrack held up fairly well over the last 20 years. The soundscape offered a reasonable amount of involvement, though I didn’t think it used the surrounds as actively as I’d expect. Occasional elements fleshed out the room – vehicles, music at a club, battles – but the track focused on the forward channels more than I would’ve anticipated. The Blu-ray boasts a good mix of extras, and we find two separate audio commentaries. The first features director Roger Donaldson, producer Frank Mancuso Jr., visual effects supervisor Richard Edlund and creative and special makeup effects creator Steve Johnson. 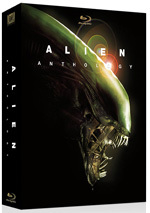 All four sit together for this running, screen-specific look at sets and locations, various effects, cast and performances, creature design and working with HR Giger, cinematography, and other aspects of their careers. Two featurettes appear. Designing a Hybrid runs 15 minutes, 48 seconds and includes notes from Edlund, Johnson, Mancuso, and Donaldson. “Hybrid” looks at the design and execution of various effects, with an emphasis on Sil. Some of the info repeats from the commentary, but this still becomes a good overview, especially since we see the technicians on the job. Previews presents ads for Into the Blue, SWAT and Underworld: Evolution. No trailer for Species appears here. Even with a worthwhile premise and a good cast, Species never becomes better than mediocre. A few decent action scenes occur but most of the film feels like wasted potential. The Blu-ray provides good audio and supplements but picture looks flawed. Species could’ve been a contender but the end result remains lackluster.